One of the traits I think is super important as a parent is being able to go with the flow. Hang with me for a minute and you’ll see why this matters when I’m talking about cribs. When I had my first little guy, for some reason I didn’t want us to get a crib right away. We had a little bassinet for him that would work for the first several months and then my plan was to transition my baby to his crib. The bassinet could be moved throughout our house and was really cool. I planned he would room in with my husband and I and sleep in there. Well, we did end up getting a crib and it was set up the day before my baby’s due date. When we brought my son home from the hospital that first night was somewhat rough. His bassinet was in our room and every.single.time. I would lay him down in the bassinet he would cry. It didn’t matter if he was almost asleep, mostly asleep, was asleep or awake he would cry the minute I set him down. I was at a loss and my husband told me “just let him sleep in our bed tonight”. haha famous last words. “Tonight” ended up being a couple years. But then we had this beautiful (and expensive) crib just sitting in my son’s nursery. The most use it was getting was as a really expensive clean clothes basket. This went on for months. Until I read about another Mom who side carred her child’s crib to their bed and so her child slept in the crib that was attached and her and her husband had the rest of the bed to themselves. I was so happy when I realized we finally had a use for our crib. So, our crib was used this way for several years and with another baby. If our third baby had been born first, he was an amazing sleeper and all my sleeping plans would have gone according to plan. My first baby needed to be next to us that first year. My sister, on the other hand, has used cribs with all 3 of her babies. They slept in a pack ‘n play in her room until about 3 or 4 months, then she would transition them into their cribs for the night. This is what worked best for her. My other “rule” about parenting? Each kid, baby and family is different, so what works for one, doesn’t necessarily work for another. My sister and I are good examples of this. Safety is always my number one concern. All the cribs on the market (even the lower priced ones) all meet the safety requirements. The main safety concerns would be the size between the slats (there is a specific distance the slats are legally allowed to be away from each other) and the paint or stain used. So now, if I were to buy a new crib again, the first thing is I would look for a cheap crib. Babies R Us was pretty much the only baby store in town (Amazon was still in it’s infancy, I bought items from there, but nothing like today) and I know Babies R US just went out of business, but the cribs there were expensive. The next most important item on my list would be asking: does it side car? This ended up being how we used our crib the most. My first son took maybe one nap in it before we side carred it. Once we started co-sleeping it was so much easier to just use our bed for all sleeping. I could relax while nursing him and then just roll him over/off me and go about my day when he was asleep for naps. Size is another factor. Sometimes the baby’s room is tiny and you are looking around before furniture is in there wondering how in the world you will be able to fit everything into this room. Other times the baby’s room is fairly large and so a larger crib is easier to fit in the space. My neighbor is having twins and while the room they will be in is decently sized, having two cribs fit into the space is a bit of a stretch. She found some really cute, basic smaller cribs that fit the room perfectly and are adorable. My sister also had twins, but the room the twins are in, there was no problem fitting two cribs in the space as well as the other furniture she wanted in her nursery. So the room your baby(ies) will be in needs to be taken into account. 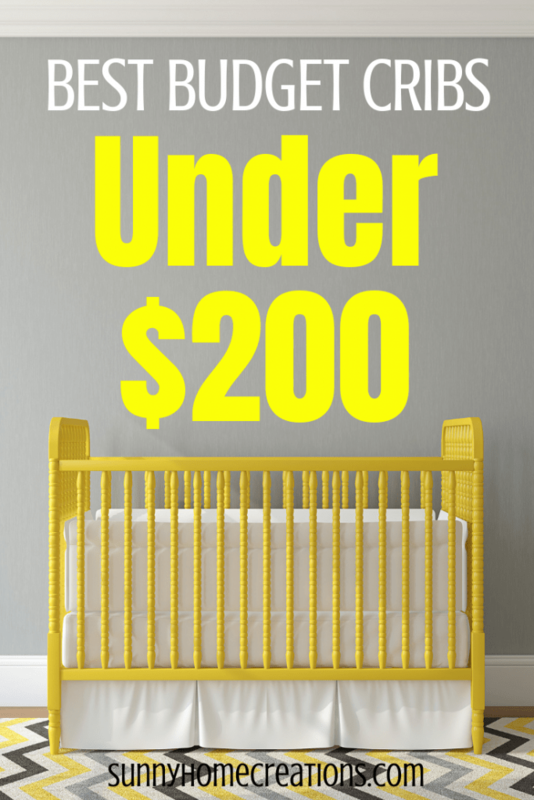 Here are some great cribs that are affordable, all of them are under $200. I also noted with each crib if I thought it could be side carred (not that you are necessarily planning to do this, but you never know). Basically, if it can be changed into a daybed and has multiple mattress levels it should be able to be side carred to your bed (assuming your bed can be side carred). If you are planning to side car your crib, please make sure to read up on how to do this and double check that your bed and the crib your purchase is able to be. Please note that if you plan to bed share or cosleep, I strongly suggest you read up on how to do it safely. At the time of this writing, all these cribs are under $200 and currently available on Amazon. So you can have your crib shipped right to your door. Can I just say how awesome that is? Especially with larger, heavier items. I love the simplicity of this crib. 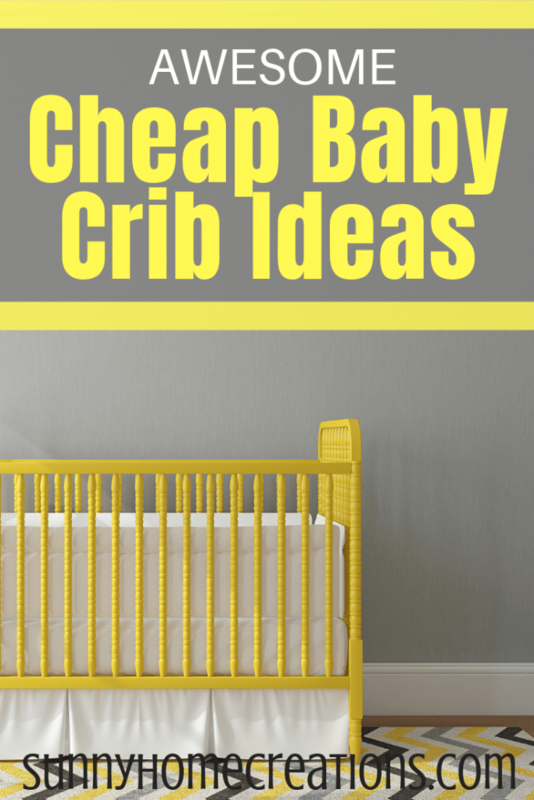 This is probably one of the cheapest cribs you can find, if you are buying new and for the price it gets the job done. One con of this crib is that it is not the sturdiest out there, although it seems like there is no fear about your baby being in the crib. I do believe this crib can be side carred, but again make sure to double check this if this is a feature you are wanting. You can look into more into this crib here. This is a gorgeous looking crib for your little one! It is sturdy which should make it so it can easily stand up to years of use. It is easily convertible, which means it can be changed from a basic crib to a toddler’s bed or a daybed (so should be able to be sidecarred) and finally can also be used as a full sized bed. This means that once you buy this crib, if you want it can be the only bed for your child that you will ever have to buy! It has a beautiful yet non-toxic paint that looks great with all types of decor and would go well with most furniture types since it is neutral in color in pine wood finishing. Moreover, with such color and finishing, it can be kept in the baby’s nursery as well as next to your own bed. 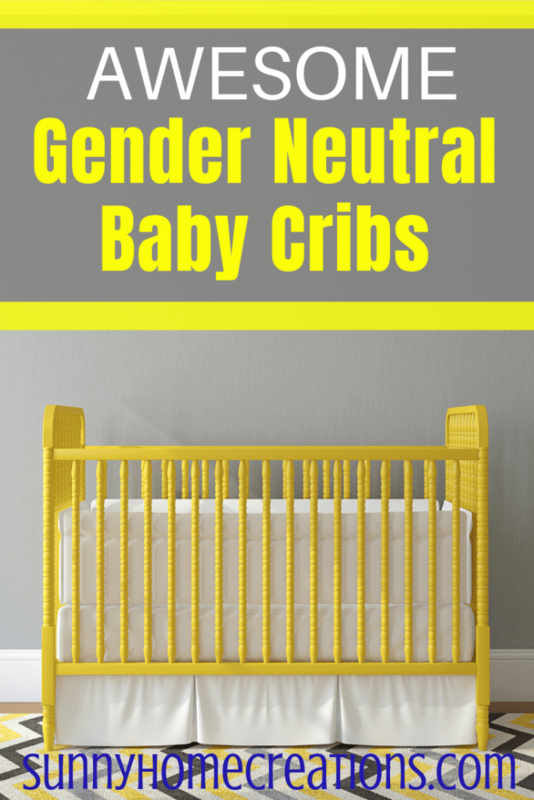 You can also use it for baby number 2 since it is gender neutral. It is a solid piece of furniture. Meets all international ASTM international and U.S. CPSC safety standards. You have to purchase the kit to make this crib into a bed. The color may look darker in person than in pictures. You can find the DaVinci Grove 4-in-1 crib here. This is the ideal crib if your baby’s nursery will be small in size and you want to make the most by maximizing the space available, without having to add extra furniture. It is equipped with both a crib as well as a changing table. There are also two large shelves under the changing table part so you can keep additional baby items in a place with easy access all the time. This crib also converts into a toddler bed, a day bed (believe you can side car this crib, even with the changing table attached, but please make sure to double check) and even a full-sized bed when the baby grows out of the crib. It has a small footprint, so if you don’t have a nursery you can keep it in your room. It includes clear instructions in the packaging. It is a trustworthy and a well-known brand name that can be relied upon. The overall style and design of the crib is very plain and may be unappealing to some people. This is the ideal choice if you are looking for a mini crib that is quite stylish yet functional. This is the perfect crib if you don’t have a nursery for your baby and would like to move this around the house, or put it in your room. It is extremely compact and user friendly. This crib is available in a variety of finishes, so you can choose the one that goes the best with the overall ambiance of your place. From white, natural and gray finishes to dark chocolate and cherry colors, this crib has a great variety of colors! It is easy to assemble and easy to put away for storage as well. It does not take up too much room and fits perfectly in most spaces. You can read more about the Delta Folding Portable Mini Baby Crib here. Priced very competitively, this crib is made of solid construction which is long lasting and durable. 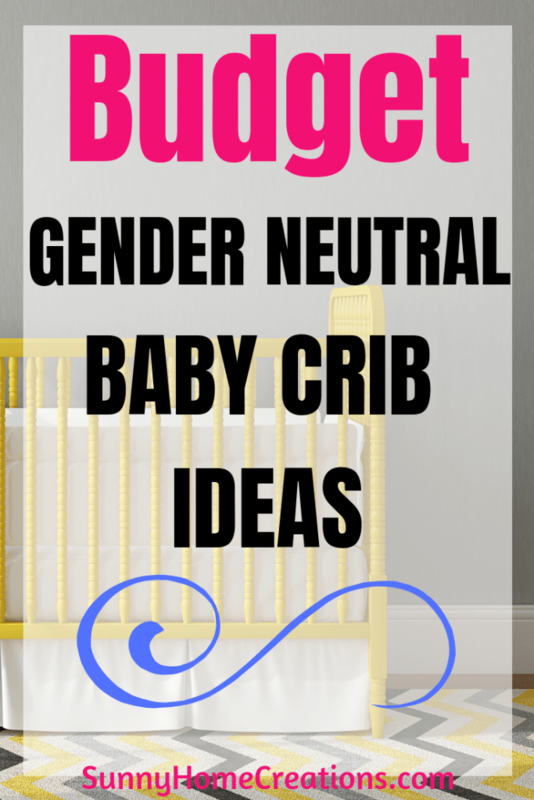 This crib is gender neutral and will blend in easily with all kinds of furniture. There are various finishes to choose from such as pecan, cherry or traditional wood. The size of the crib is also compact, making it practical yet functional for use. The small size is ideal for closed spaces or a small nursery. The process of assembly is quite simple. The shipping of this crib can take a long time. You can find about the LA Baby The Little Wood Crib here. A major part of the beauty of this crib is that it is made of metal, which is quite unique in cribs. This makes it easy for the user to move the crib around, yet provides a sturdy and stable crib for use. This crib is available in brown due to the metal, but it can be painted to match the color of your baby’s nursery. This makes it quite simple and easy to customize the crib for use in the nursery, without having to worry about priming wood. It has a solid construction making it safe for the baby. It can easily accommodate older babies or those who move around a lot. Repainting the crib does not give a smooth finish and may appear streaky. Go here to read more about this LA Baby Mini Portable Crib. This DaVinci Alpha Mini Rocking crib is a great choice for small spaces and it can also be moved around from one place to another very easily. It is completely non-toxic which makes it very safe for babies and is also lead and phthalate safe. It is available with wheels so you can easily transport it from one room to another. If you don’t want the wheels they are easy to remove. It is stylish yet very functional. This crib is another with a small footprint and can fit through standard doorways. It also comes with a waterproof mattress pad that is an inch thick and has 4 levels of mattress support as well. Overall, this crib is solidly constructed, making it durable and sturdy along with strong slats which are able to keep your baby safe and secure. There are many different cribs available, even under the $200 price mark. You just need to decide what is important to you when making the decision. Also, remember some of these that are more portable or work better for lighter babies might not be the best choice if you are planning to use this crib long term with your baby. If you found this useful, I’d love for you to “PIN IT”! Previous Post: « German Christmas Decorations that are AWESOME!